When I was growing up, my family gathered at the table together almost every night for a home cooked meal. I know that this is no longer the norm in our culture—for a variety of reasons. And although I do have a lot to say on this subject, much has already been said by others more informed and more eloquent than I...and it really isn't the point of my post. The reason that I bring up the dinner table of my childhood is because it was so unusual for us not to sit down together that I have fairly vivid memories of those rare occasions. One of those nights was Halloween. I suppose that Halloween in our house was much like what today's parents are dealing with every night. The varying Halloween activities (and the timing of those activities) for a household of four children whose ages spanned nine years made it difficult to arrange a meal time that worked for all of us. I remember that my mother made pancakes for dinner on Halloween several times. Since pancakes come out of the pan in pretty much single serving batches, it was easy for my mother to stand at the stove and cook and feed each kid on an individual, as needed, basis. I love pancakes....even now I almost always order them when I go out to eat for breakfast. Having them for dinner was a special treat when I was a kid. I know I mentioned in my previous post that my mother kept sugary foods to a minimum in our house, so the fact that we had pancakes for dinner on a night when we were going to gorge on candy is probably another reason I remember this meal so well. 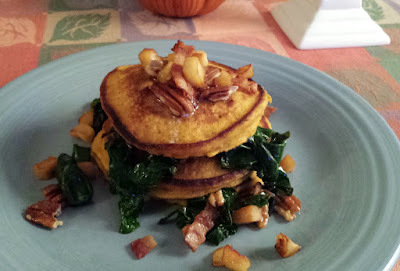 A few years ago, I ran across a recipe for pumpkin pancakes in an issue of Martha Stewart Living and the thought of those Halloween dinners came to mind. As an adult without children, Halloween is not one of my favorite holidays, but I have taken nostalgic pleasure in recent years in making these my new traditional dinner for October 31. Since I am unable to eat just pancakes and syrup for dinner anymore—even with my sweet tooth, this seems rather unappealing—I serve them with other savory autumnal foods for a comforting and nourishing feast. Pancakes of course bring to mind sausage and bacon, so this dinner always includes one or the other. Apples are another appropriate addition. And it always turns out that I have greens of some kind on hand at this time of year. One year I had some cabbage sprouts from the farmers' market, so we had pumpkin pancakes with shredded cabbage sprouts—braised with red onions and apples and all served alongside some nice Italian Sausage. Another year the cabbage sprouts were replaced by shredded Brussels sprouts. Instead of sausage on the side, I added bacon to the braise along with the apples and onions. This year I had some spinach on hand and thought a warm spinach salad would be a good accompaniment along with some crispy bacon. To make the salad, I made a sharp vinaigrette with some sherry vinegar and olive oil. I didn't add any maple syrup to this, but in retrospect, a touch of maple syrup in the vinaigrette would have been nice (and maybe some finely diced shallots too). When the pancakes were ready to serve, I returned the pan I had cooked the bacon in to the heat. When the pan was warm, I added a small amount of bacon fat back to the pan and added the spinach, tossing and stirring until it was beginning to wilt. I transferred the warm, half-wilted spinach to a bowl and added some of the vinaigrette, a diced sautéed apple and a few toasted pecans. Of course, even at dinner, I still serve the pancakes with butter and maple syrup. It wouldn't be Halloween without something sweet. In a medium-sized bowl, whisk the dry ingredients together. In a separate bowl, stir together the milk, pumpkin, butter and egg. Fold this mixture into dry ingredients. Melt a small amount of butter in a skillet over medium heat; pour in 1/4 cup batter for each pancake (I use a 1 1/2 oz. cookie scoop). Cook pancakes for about 3 minutes before turning—or until bubbles appear all over the surface of the batter. Flip the pancakes and continue to cook until springy to the touch—another 2 minutes or so. Transfer to a serving platter and keep hot in a low oven (loosely covered with foil) until all the pancakes are cooked. Serve the pancakes with butter and pure maple syrup. Makes 8 to 10 pancakes. Variation October 31, 2017: Saute the diced apple and set aside. Toast the pecans and toss with a drizzle of oil and some salt. Cut the bacon crosswise into 1/2-inch pieces and cook until crisp. Reserve the bacon fat. When ready to serve (the pancakes are cooked), place a large saute pan over high heat. Drizzle in enough bacon fat to film the pan and add the spinach with a pinch of salt. Cook until wilted and tender (this will take about a minute) toss in most of the apples, bacon and pecans. Sprinkle a small amount (to taste) of sherry vinegar and toss to distribute. Transfer to a plate to stop the cooking process. 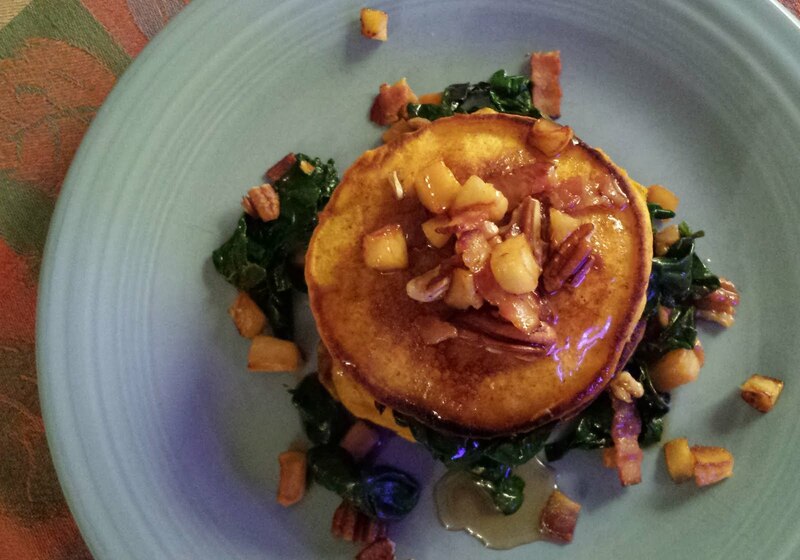 Layer the spinach with the hot pancakes on individual plates, top with a small smear of butter and a scattering of pecans, apples and bacon. Drizzle with maple syrup (not too much) and serve. We love and have breakfast for dinner probably once a week. These pancakes seem perfect for use of the canned pumpkin. I always seem to have leftover pumpkin.